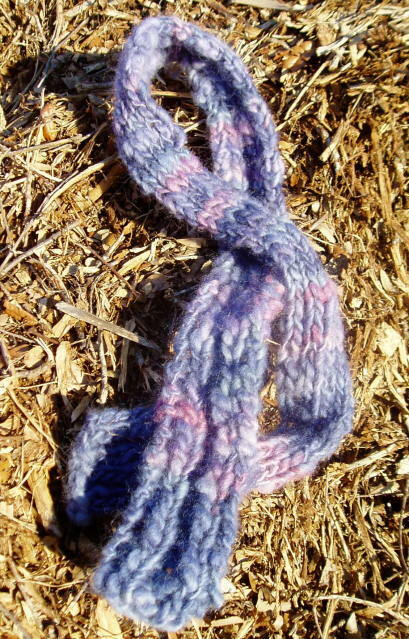 When I lived in the Santa Cruz Mountains, in the wagon train days of the late ’70s, I knit a scarf that I adored. 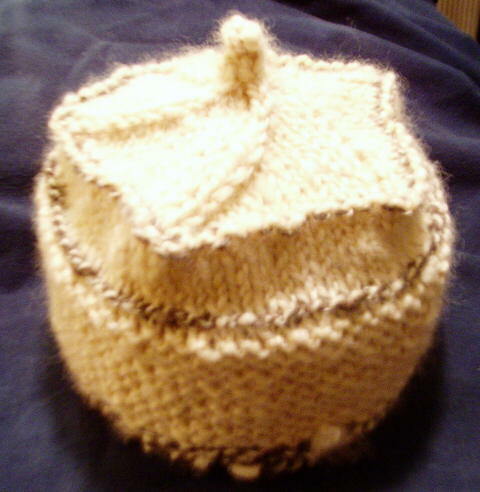 It was knit from handspun singles as thick as your thumb. Sort of an oatmeal color. What a great scarf. Maybe I can find a picture of it. I wish I still had it around, but I don’t. In 1982, I left it at in the changing room at a ballet class. The next week, I had an injury that took me off my feet for a year and a half. By the time I went back to ballet class, my favorite scarf had been found by someone else. The great thing about my Fricke is that the orifice (see that triangular loop in the lower right?) is completely non-restrictive. I’m using the standard flyer, here, and still, am able to spin fat. The flyer hook and the loop are about 1/2″ in diameter, so these become the limiters in the equation. So…starting with ultra-pre-drafted handpainted roving (I found some nice mohair blend in the chest, and I still had a couple jars of acid dye from a session a few decades back), very low tension, and a very slow foot, I managed to spin 60 yards of pretty darn fat and fluffy singles yarn with that 4 ounces of roving. Doesn’t this look soft? Well, it is. Like a powder puff. Remember powder puffs? 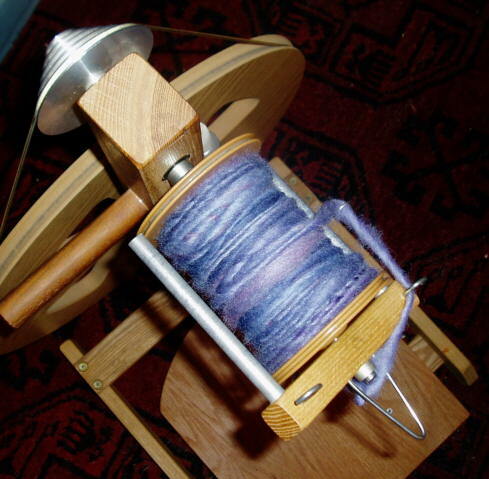 Anyway, this is one bobbin full…about 2 oz, and 30 yards. I spun the second half of the roving and then, yes, knit the scarf. This will be embellished just a little bit. Some felt balls on the end, I think. Fancier than my old Boulder Creek scarf, but just as light and lush and warm. Don’t you want one? 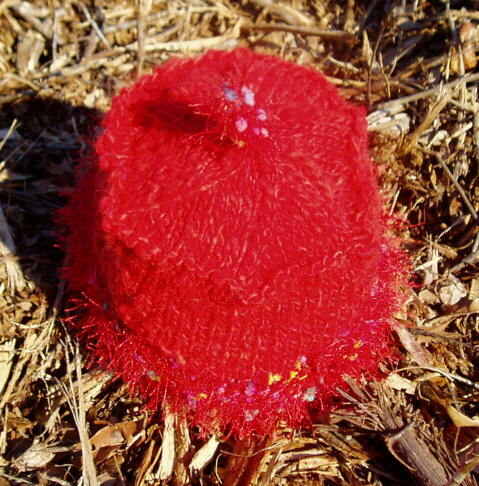 Any idea how hard it is to take a picture of a bright red hat with turquoise blue chenille blobs in a funkyfur band? You wouldn’t believe. With my Olympus, anyway, it’s not easy. So…that said…here I make the disclaimer that the color of the hat in person is way different than the color on the blog. IRL, the hat is vermilion. Big fat vermilion handspun. Here? Well, heck, you can’t even see the decrease swirls. It’s a cute hat…a hexagon top, fake fur band, with totally over-the-edge fur I-cord on the top. There’s a vintage look here…reminds me of 1955…for some reason…or other. Inspired by Ray’s Hat, which spontaneously burst from my needles a few weeks back, I wanted to knit a hat that had plush warmth, weight, and a flat top. HA! Okay. That wasn’t hard at all. 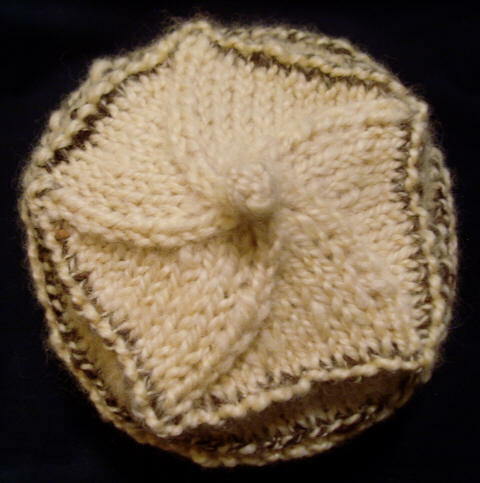 Here’s the five-sided top of a Funky Hat knit from a super-bulky 2-ply Border Leicester yarn. The breeder of these BL sheep sent me samples of her CVM fleece. 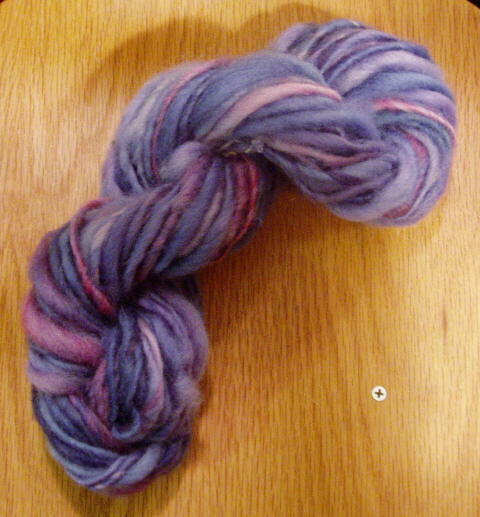 I bought the softest, darkest fiber…one that wasn’t actually for sale – but was an example of her finest fleece. Fortunately, the shepherd was as overcommitted as I am, and she let “Gracie” come home to me. The very dark CVM was blended with black alpaca (ply #1) and plied with a thick and thin Border Leicester single. This “beginner’s mind” yarn “outlines” this hat in more ways that one. This hat is a paean to all that shepherd love at Pheasantfield Farm in Chestertown, Maryland. Here’s another view…not the greatest picture…I can’t get that lovely outside light, because, well, I’m a wimp. It is too cold for me to be staging hat photos, today. A bit too soft-focus, but you get the idea. This morning, I knit another hat using this model. It has a “fur” yarn integrated in the band, and the crown is six-sided. It’s vermilion. You’ll have to wait til tomorrow for a picture. Sorry. A pdf of the pattern will be available for sale on etsy in a day or two. I want comments back from my testers before it’s released. My grandmother, Rose, came to America on a ship at the end of the 19th Century. The little Irish girl grew into a short narrow woman with thick auburn hair and light blue eyes. She bought her clothes in the children’s department. She was small in stature, with size 4 feet, but her hands were as big as mine. Her hardworking hands were knobby and strong, but softened by creams and lotions. These mitts, she would have loved. 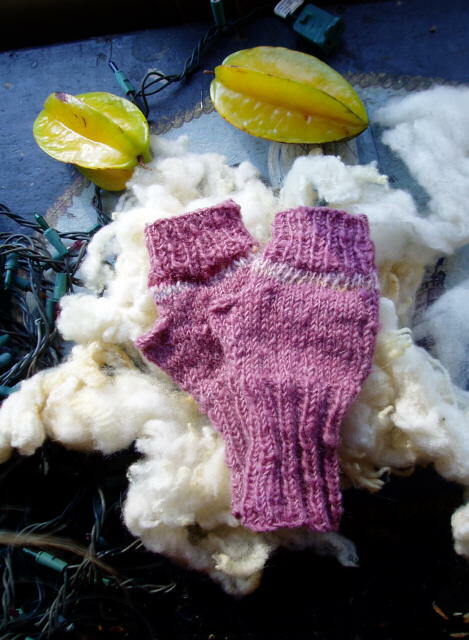 Rose mittens for Rosie. Yes, these would have sent her over the moon. Rose Quinn Mittens: 82 yards of mohair/wool blend handspun singles, acid dyed, 12 wpi, and a few yards of a similar weight yarn handspun from a handpainted roving. Size 6 and 5 dpns.